Home Unlabelled The 2nd Precision Air Services PLC Shareholders' Annual General Meeting - to be held today. 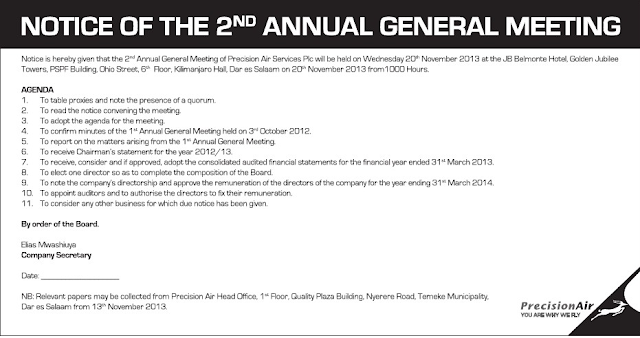 The 2nd Precision Air Services PLC Shareholders' Annual General Meeting - to be held today. 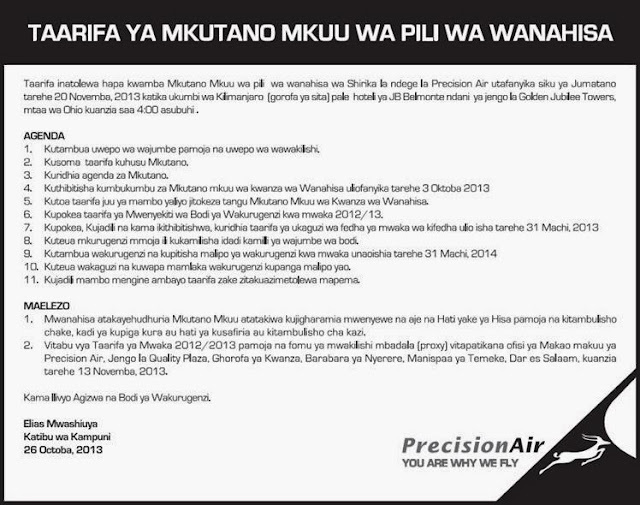 The Annual General Meeting of Precision Air Services PLC, will be held today, Wednesday November 20th 2013 at 1000am in Dar es salaam city centre at the Golden Jubilee Towers, 6th Floor, in the Kilimanjaro Hall. As per the notice given, all shareholders are reminded to bring their share certificates during the meeting.The AGM will be held at JB BELMONTE HOTEL,Golden Jubilee Towers; PSPS Building;Ohio Street;6th Floor,Kilimanjaro Hall,Dar Es Salaam on 20th November 2013 1000 am.